Mike Greene - mgreene@shawmedia.com Sarah Lister, of Woodstock, and Curtis Borawski, of Long Grove, take an order to-go Thursday, August 9, 2012 at FasTaco in Woodstock. FasTaco, a family-run mexican restaurant, is one of a number of late night options for those looking to grab a bite after dark. Mike Greene - mgreene@shawmedia.com Samuel Ruiz works on an order Thursday, August 9, 2012 at FasTaco in Woodstock. FasTaco, a family-run mexican restaurant, is one of a number of late night options for those looking to grab a bite after dark. Mike Greene - mgreene@shawmedia.com FasTaco owner Hector Ruiz flips a steak on the grill Thursday, August 9, 2012 at his restaurant in Woodstock. FasTaco, a family-run mexican restaurant, is one of a number of late night options for those looking to grab a bite after dark. Mike Greene - mgreene@shawmedia.com Woodstock residents Erik Meyers and Jessica Edwards laugh while eating Thursday, August 9, 2012 at FasTaco in Woodstock. FasTaco, a family-run mexican restaurant, is one of a number of late night options for those looking to grab a bite after dark. Mike Greene - mgreene@shawmedia.com Alondra, Sulema, Vanessa, and Hector Jr. pose with their father and FasTaco owner Hector Ruiz Thursday, August 9, 2012 at FasTaco in Woodstock. FasTaco, a family-run mexican restaurant, is one of a number of late night options for those looking to grab a bite after dark. Sarah Lister, of Woodstock, and Curtis Borawski, of Long Grove, take an order to-go Thursday, August 9, 2012 at FasTaco in Woodstock. 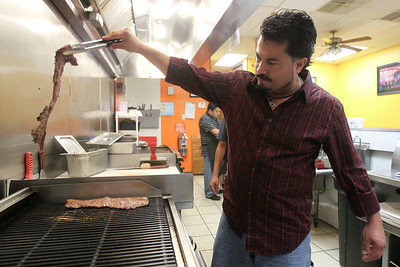 FasTaco, a family-run mexican restaurant, is one of a number of late night options for those looking to grab a bite after dark.